There are few greater joys in life than having a best friend. However, just because you think someone is your best friend doesn’t always mean that you are theirs, and realizing this can be truly heartbreaking. Such is the reality for a 2013-model George Foreman Grill in Des Moines, Iowa, who considers the 7-year-old boy he shares a home with to be his best friend, even though he has no way of telling him. Wow. This is the saddest thing you’ll read all day. From his perch between the coffee pot and the knife block, the George Foreman Grill has spent the past four years of his life quietly observing Caleb, the cheery young son of his owners, whose playful spirit and thousand-watt smile have consistently brought light and happiness into the countertop grill’s otherwise humdrum everyday existence. 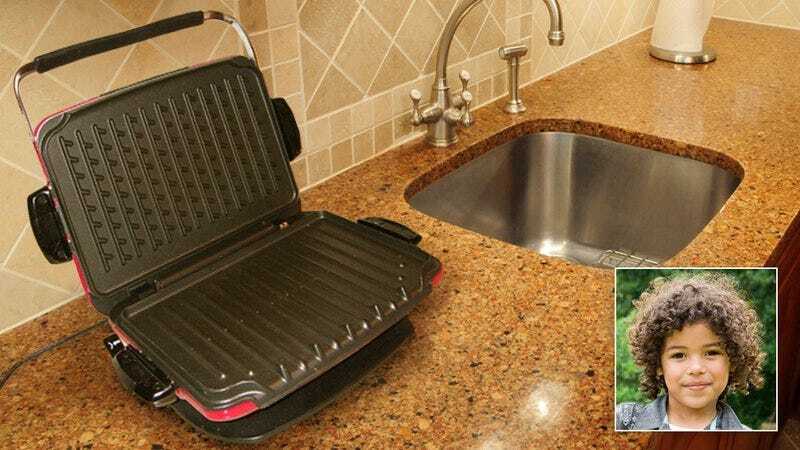 But while the George Foreman Grill constantly daydreams of riding bikes around the neighborhood with Caleb and swapping giggly secrets with him at sleepovers, the sad truth is that he is physically incapable of speaking to his housemate and will likely spend the remainder of his time hopelessly yearning for a friendship that can never be reciprocated. Whether Caleb is on the step stool helping his mom mix cupcake batter or just mulling over his reading homework at the kitchen table, the George Foreman Grill relishes any occasion to be in the first-grader’s presence and has gradually come to consider the boy his best friend in the entire world. Caleb, however, has no idea how much the George Foreman Grill loves him or how much it hurts the appliance when his mother stows him away in the dark kitchen cabinet for long periods of time, forcing the grill to go weeks on end without seeing his most treasured pal. While it’s certainly frustrating for the George Foreman Grill to see Caleb spending time with other kitchen equipment, it’s particularly upsetting for him when the 7-year-old invites over his classmate Miles, who is rude and says cuss words and is clearly only using Caleb for his Nintendo Switch. Caleb, for his part, could not care less about any of his kitchen appliances, but the George Foreman Grill once got so angry after hearing Miles laugh at Caleb that, had he been born with the gift of mobility, he would’ve clamped his grilling plates over the child’s face on high heat and burned him to death right then and there. Tragically, though, the George Foreman Grill will never get the chance to stick up for Caleb, nor will he ever be able to listen to Caleb confide in him about the girls he likes or help him assemble the half-finished Lego Star Wars snowspeeder he got for his birthday. Instead, the George Foreman Grill will just remain in his spot on the counter, accumulating feelings and dreams he will never be able to share, silently rooting for Caleb while simultaneously worrying that his best friend will grow up and leave him behind when he goes to college or, worse, that he is deemed to be junk by his owners and sold off at a garage sale. It’s heartbreaking to think about, but the reality is that the George Foreman Grill was never designed for companionship or anything more than making food. Yet perhaps one day his dreams will somehow come true and he and Caleb will finally become best friends forever.